This article gives you a review of the 2019 Genesis G70. 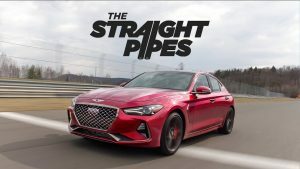 In the video, you can see that they have got the brand-new 2019 Genesis g70 sport all-wheel drive twin turbo v6. Which is the same engine that’s in the Kia Stinger. However, I am here to tell you that this car drives better than the Kia Stinger. So we’re gonna test drive that as well, we’re actually gonna do a lot of crazy stuff today. This includes the autocross and mont-tremblant race track circuit. Mont-tremblant, it’s a circuit more from a row. So this is their first sporty car. The sportiest that they make besides the Genesis Coupe. They don’t make that anymore, but it did exist under Hyundai same logo. Yes and as far as I’m concerned the same hood. Take a look at this comparison to let me know if they drew some inspiration from that. I think they definitely did, and I think that they should have because that was a good car. It’s what put Genesis on the map for younger people. It all started with that smashing pumpkins. The Billy Corgan commercial, the first time I saw it. The yellow genesis is drifting. From that point on Genesis was cool alright. Let’s get to some numbers we are in the 3.3-liter twin turbo v6 365 horsepower and 376 Pompey to torque very similar to the Stinger. However, this weighs less, and you can actually feel it that’s the most significant difference between this and the stinger. This drives so much better because you can feel the weight difference and if you actually put in a sports mode. It shifts a little bit faster than all the other models. Which is nice for them to do. They said it shifts as quickly as the BMWs at f/8 speed. I think it shifts pretty much the same time which is good. We get the looks. I want to talk about power and handling stuff. Looks alright ok, what does this compete with anything in the luxury compact sports car segment Series 3. Series c-class, that kind of thing. Its kind of looks BMW ish it has a little bit of 3-series influence from the side. A little bit, but it does look like a Genesis it’s got cool taillights. I like the taillights I love the overall rear-end. Think that’s my favorite part of this car regarding looks. I agree it’s wide and low and it just looks so stalking aggressive, and we got the big oval exhaust, and the exhaust sounds okay. Not my favorite, but it seems pretty good. The exhaust isn’t connected. The best part is the mufflers aren’t bright silver they’re dark, so you can’t tell that it’s not connected precisely this car does not have the sports exhaust. Only the 2-liter turbo has the sports exhaust. However, they are working on possibly getting a sports exhaust for the 3.3 turbo. The front end it’s very Genesis II. It’s got that big Genesis grill. The Sport trim has black chrome on it. I don’t really like the silver as much, but the silver does look alright. I agree I think you’d need to get the sport just for all the blacked out chrome stuff. The one thing that I hate about the sports though wheels completely wrong wheels for this car. I mean they show off the Brembos nice. They do, but I think the 10 spokes are better that come on the lower trims. Those look amazing, those are my favorite wheels for this car for sure. They’re also 19’s they look actually perfect for this car. Genesis you kind of expect them to put that out very true, as for looks on the Genesis g70. I think the front bumper is a little too round and think the front view isn’t the best view. It’s like a three-quarter view. I can agree with that. I think it complements the headlights more because looking straight on it doesn’t have a cool design like the g8 II. Do you like the headlights? I like the headlights from the front 3/4 view is ok, because when you’re looking at that. Then the lines make sense speaking of the overall front end the boomerang vents. Let’s have some fun at the track. All right we’re in the G 70 on the race track, now following the instructor. This thing is pretty fast on here it seems like you’ve never really run out of speed and every gear is usually pretty reliable. Got Yuri behind me he’s probably having a blast in this. Like this more than the stick shift. The speed more than I like shifting. Feel like I’ve betrayed my image. The cars definitely have some body roll, but it’s very controllable especially the sport mode. It was a lot more hunkered down which is nice. These tires hook so hard sure he’s keeping up pretty well. He’s a little further back right now. But he’s doing just fine 202 under braking 190. All right hit 200 on the track I’m happy under braking. It’s perfect, Brembos have been lasting all day, and the people have been driving these cars pretty hard. No point have I felt that this car has gotten away from me. I feel and full control the whole time it definitely feels all-wheel drive it’s definitely, but the turning is very direct. I really appreciate that. Taking turns on 150 kilometers an hour a little slide there 150 K yeah. I like the v6 twin-turbo more than the stick shift force on there. Don’t need to be in cruise control for it to work anything over 65 it takes over keeps you in your lanes. Very well and there’s a physical button to turn it on or off and you can also turn it off through your center display. The center thing is very cool it’s got different colors for every mode. But it’s got this like carbon-fiber light glowing texture, which I think is very cool. We have a turbo and a torque gauge which I appreciate, and there’s no lag. In it, we also have a heads-up display. One of the coolest parts about the heads-up display is that. When you put it the sport mode. It italicizes the numbers, yes it does because everybody knows italicized numbers means you’re going faster. Because if the numbers are like this, that means you’re speeding because of the wind resistant opposite. It does have apple car play and android auto, so thank you there is no way to control it with a touchpad. It’s the only touchscreen which is, but we’ve been talking about how it’s similar to every other company. We think that’s probably the biggest complaint. Is that it should be differentiated more with different graphics. So that you’re not thinking you’re in a Hyundai. You’re in a Genesis that is true that’s the number one complaint. But I understand that you don’t want to ruin a perfect interface because this is pretty perfect. If they change the graphics around like that it would be kind of cool. But that’s it, I think in the future they will they just wanted to make sure that it came out working correctly. First what they did do right is this interior it is six degrees tilted toward the driver. I had like the Kia stinger. If I want to rewind satellite radio stations, there’s an excellent little platform to put my hand. So I can click back, and in this particular model, we have red stitching. You can also get grey stitching, and we’ve got volume knobs and hard buttons for everything. Which is excellent, however, one minor issue piano black right up top. But it’s so minimal I don’t care. So thank you, Genesis, for doing that it’s like the least piano block of any car ever then we have wireless charging down here. We have a USB port and an aux cord no USB. It’s not that futuristic, yet we have aluminum trim down here which looks very nice. I was also in the stinger that we forgot to mention. From these seats, it kind of goes down with a piece of cloth and it kind of gets in the way of your toes. The seats do fold down 60/40 split speaking of the trunk, it’s a decent size kind of small the opening. I’d like to talk about the 2.0 t sport for a bit even though we’re not driving it right now. Hit me with it 252 horsepower and 260-pound feet of torque, and it’s manual, did I mention it’s manual because yeah. We know it’s imagined and you know what it also has a mechanical LSD, so they basically made a luxury tuner car rear wheel drive. Brembos on all four corners LSD manual turbo 2-liter it’s a tuners dream. It’s like almost ready for the hot hatch challenge a rear-wheel drive and not a hot hatch. The written article does not cover the full review on 2019 Genesis G70, please watch the full video to learn about it. If you have any doubts please feel free to comment.